The China-Pakistan Economic Corridor project is the bridge of regional interconnection designed to benefit not just the host countries but also the neighboring ones of Iran, Afghanistan, India, and Central Asia, along with being a profitable journey towards economic regionalization. The importance of CPEC lies in the improvement of bilateral ties as well as ambitious planning and investment in a number of sectors, from health, agriculture, and tourism, to finance, communications and human resource. Under the pact, a number of infrastructural projects are being constructed and special economic zones established, not to mention the introduction of augmented power generation capacity and a vast network of railways and highways intended to connect Gwadar and Karachi with the Xinjiang region in China. Pakistan and China signed an agreement to commence work on the $46 billion of development projects. CPEC is announced as “an economic and development project for the benefit of the people of the region”. Completed projects include a bypass consisting of two large bridges and five kilometres worth of tunnels. On 13 November 2016, CPEC became partly operational when Chinese cargo was transported overland to Gwadar Port for onward maritime shipment to Africa and West Asia. An agreement is settled to build $1.5 bn oil refinery, irrigation projects, a $2 billion motorway spanning from Chitral to DI Khan. $1.8 billion Sahiwal Coal Power Project became fully operational. More than $14 billion worth of CPEC projects were under construction. Pakistan kick started many energy projects while focus switched more to hydropower CPEC projects. Saudi Arabia enters partnership within CPEC countries to help finance three road infrastructure and energy projects. Three agreements worth $16.1 million is divided to fund health and education projects. CPEC is fully completed, bringing peace and prosperity to two nations while promoting spectacular economic growth within Central Asia and South Asia. Kings Park Gwadar gives you 100% ownership of your land. At the initial stage of giving 30% of the total value of the plot you receive an acknowledgment letter by Kings Park Gwadar stating the exact location and plot number. 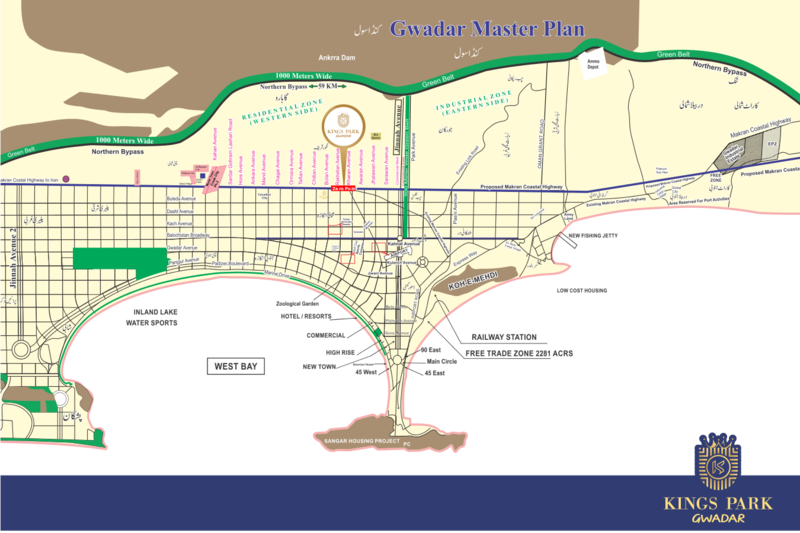 A letter is sent from the Gwadar District Authority when 60% of the total payment of the plot is made. This letters makes sure that the plot is under the name of the person who applied for the plot and is an official document used by the GDA.